A healthy 19-year-old male presented with complaints of right ankle pain. Twelve hours before, he had jumped off a skateboard, inverting and abrading his right ankle. 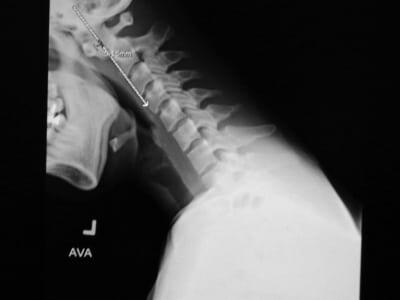 A 32-year-old female presented to the emergency department after a motor vehicle collision with complaints of thoracic back pain. A 30-year-old man presented to the emergency department after a motorcycle accident at high speed. He reported neck pain and referred paresthesia along the fourth and fifth fingers of both the left and the right hand. The patient arrived at hospital hemodynamically stable. We present a case of pylephlebitis, which is an infective suppurative thrombosis of the portal vein. Pylephlebitis is an uncommon complication of intra-abdominal infections and carries with it significant morbidity and mortality. The objective of this study was to determine the prevalence of intra-abdominal injury (IAI) and death in hemodynamically normal and stable BAT patients with initially negative ED evaluations admitted to an ED observation unit and to define a low-risk subgroup of patients and assess whether they may be discharged without abdominal/pelvic CT or observation. 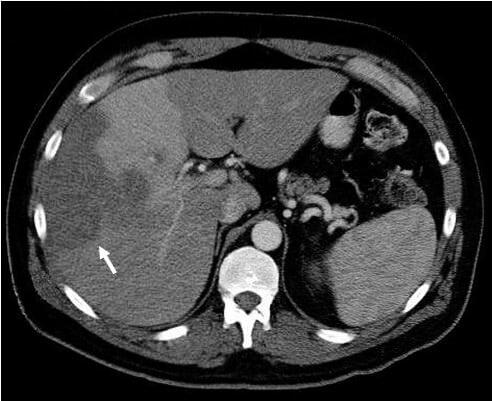 A 49-year-old white man was admitted to the emergency department with nausea and diarrhea of 11 hours duration. He had experienced crampy abdominal pain as well. He reported that his stools had been dark and malodorous. He had no prior history of gastrointestinal disorders, nor travel, unusual oral or liquid intake. There was a remote history of alcohol abuse, but no hepatitis or cirrhosis. Recent alcohol intake was denied by the patient. He had no medical allergies. His past medical history was pertinent for a history of hypertension, congestive heart failure, and a dual chamber pacemaker insertion. There was no history of diabetes mellitus, smoking, or myocardial infarction. Medications included lisinopril, a small dose of aspirin daily, and thyroid supplement. Family history was negative for cardiomyopathy, sudden cardiac death, gastric or duodenal ulcers, colon cancer, or any congenital abnormalities. 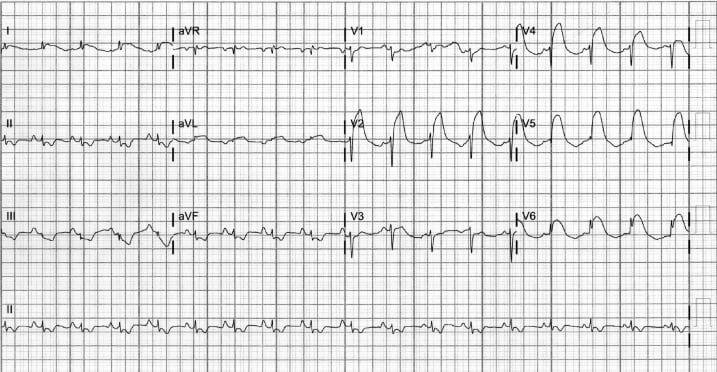 We present the case of a 32-year-old woman who presented to the emergency department with a witnessed cardiac arrest. She was otherwise healthy with no cardiac risk factors and had undergone an uneventful repeated cesarean section 3 days priorly. 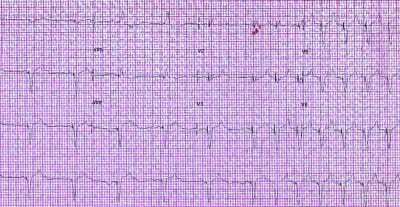 The patient underwent defibrillation, out of ventricular fibrillation to a perfusing sinus rhythm, and was taken to the catheterization laboratory where coronary angiography findings showed spontaneous dissection of the left anterior descending artery. The patient received a total of 6 stents during her hospital stay and was eventually discharged in good condition. Spontaneous coronary artery dissection is a rare entity with a predilection for pregnant or postpartum women. Early diagnosis and treatment are key for survival, and when identified early, mortality rate is reduced. 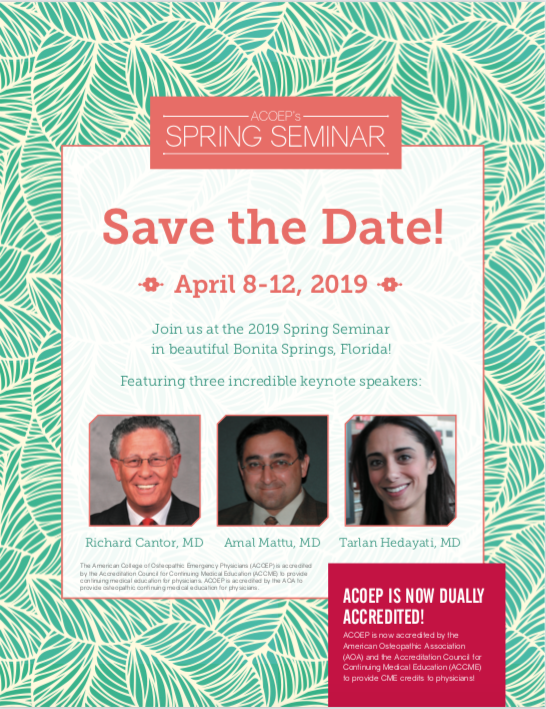 Spontaneous aortic dissection in pregnancy is rare and life threatening for both the mother and the fetus. Most commonly, it is associated with connective tissue disorders, cardiac valve variants, or trauma. We present the case of a 23-year-old previously healthy woman, 36 weeks pregnant with a syncopal episode after dyspnea and vomiting. She subsequently developed cardiac arrest and underwent aggressive resuscitation, emergent thoracotomy, and cesarean delivery without recovery. On autopsy, she was found to have an aortic dissection of the ascending aorta. 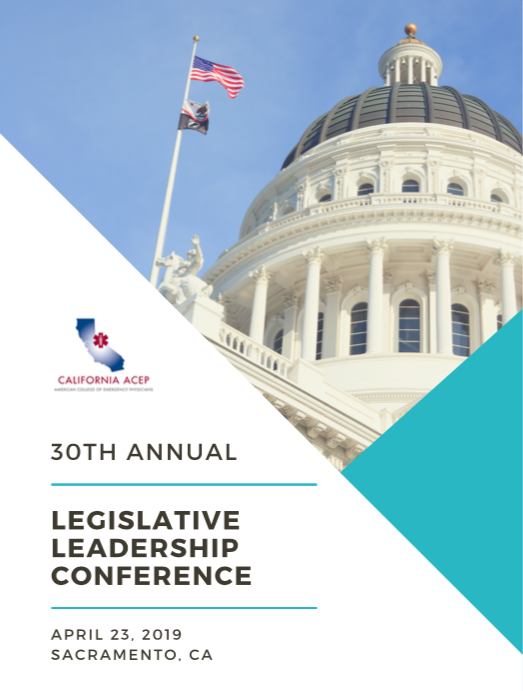 This case is presented to raise awareness and review the literature and the clinical approach to critical care for pregnant patients. Drug rash with eosinophilia and systemic symptoms (DRESS) is a rare, severe adverse drug event that appears with a generalized rash, fevers, and dysfunction of 1 or more organ systems. We describe 2 patients (1 adult and 1 pediatric) seen in the emergency department with DRESS, and review the clinical presentations, potential complications, and management of DRESS. Although rare, it can be associated with significant morbidity, including liver failure and death, and should be considered in the differential diagnosis of patients with diffuse rash and systemic symptoms. We established the most common cutaneous diseases that received dermatology consultation in the adult emergency department (ED) and identified differentiating clinical characteristics of dermatoses that required hospital admission. Erythema gyratum repens (EGR) is a rare and characteristic, paraneoplastic rash associated with a variety of malignancies, most notably lung, esophageal, and breast cancers. This case report details the appearance, epidemiology, diagnosis, and treatment of EGR. Prompt identification of EGR is essential, as the rash often precedes the diagnosis of malignancy by several months. Urgent patient referral to evaluate for malignancy is crucial, as this may lead to decreased morbidity and mortality. 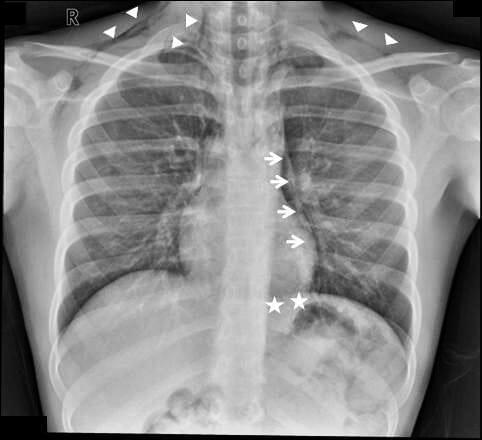 A 29-year-old man presented to the emergency department (ED) with a rash across his chest and abdomen. The rash began 2 hours before his arrival and was initially pruritic, but subsequently became painful. The patient also complained of acute onset of aching pain in both hips and his left arm. 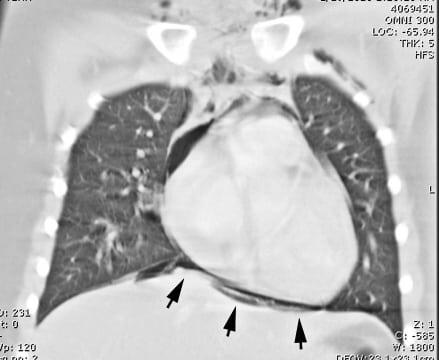 He denied associated chest pain or dyspnea, and had no paresthesias or disequilibrium. Routine laboratory studies and chest radiograph were normal. Earlier in the day, the patient had completed a dive to 235 feet in depth in Lake Mead, Nevada, but reported a very controlled ascent with appropriate decompression stops. Two days earlier, he had completed a dive to 315 feet in Lake Mead without any problems. Emergency medicine (EM) is a young specialty and only recently has a recommended medical student curriculum been developed. 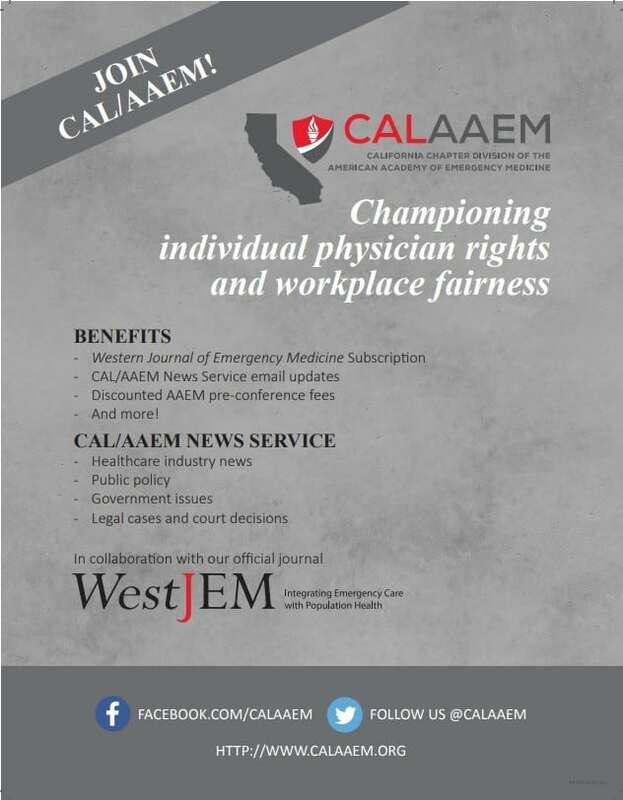 Currently, many schools do not require students to complete a mandatory clerkship in EM, and if one is required, it is typically an overview of the specialty. 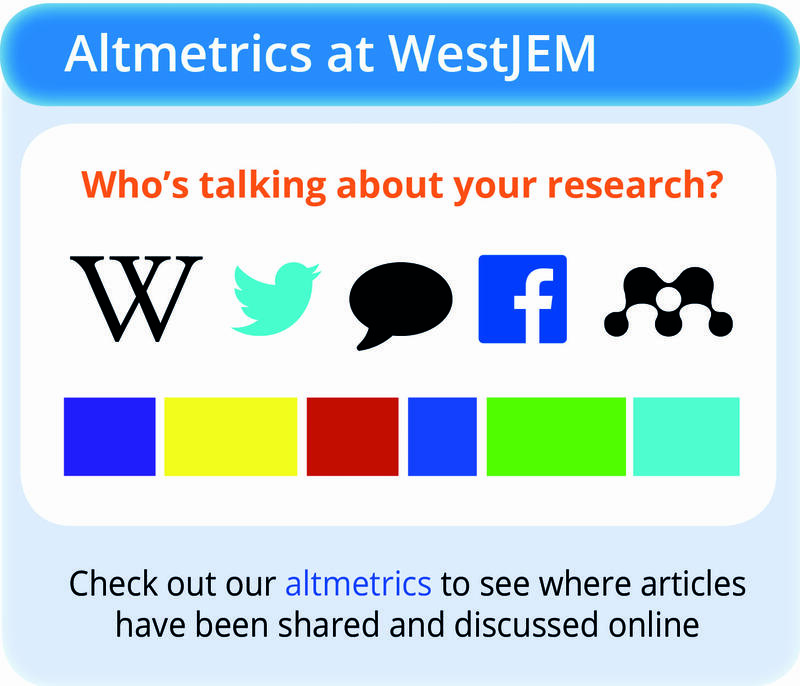 This study seeks to evaluate the practice patterns of current combined emergency medicine/internal medicine (EM/IM) residents during their training and compare them to the typical practice patterns of EM/IM graduates. We further seek to characterize how these current residents perceive the EM/IM physician’s niche. Feedback is a technique used in medical education to help develop and improve clinical skills. A comprehensive review article specifically intended for the emergency medicine (EM) educator is lacking, and it is the intent of this article to provide the reader with an in-depth, up-to-date, and evidence-based review of feedback in the context of the EM clerkship. In this report, we discuss a case of a 14-month-old male presenting in the emergency department with refusal to bear weight on his left leg. 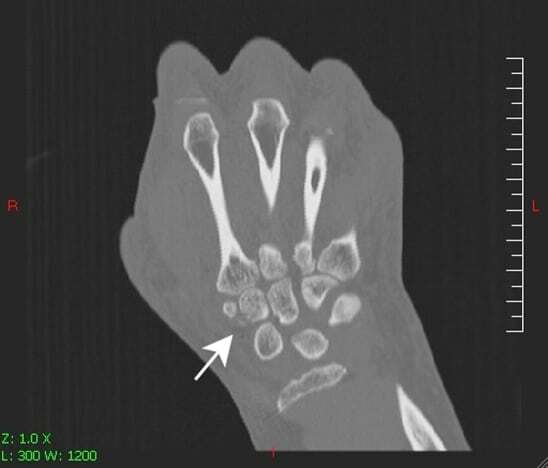 Plain radiographic studies revealed no evidence of effusion, fracture, or dislocation. An 11-year-old female presented to the emergency department with fever of 1 day’s duration and sore throat. Her family described a 3-week history of cough with fever, trouble breathing, and wheezing. 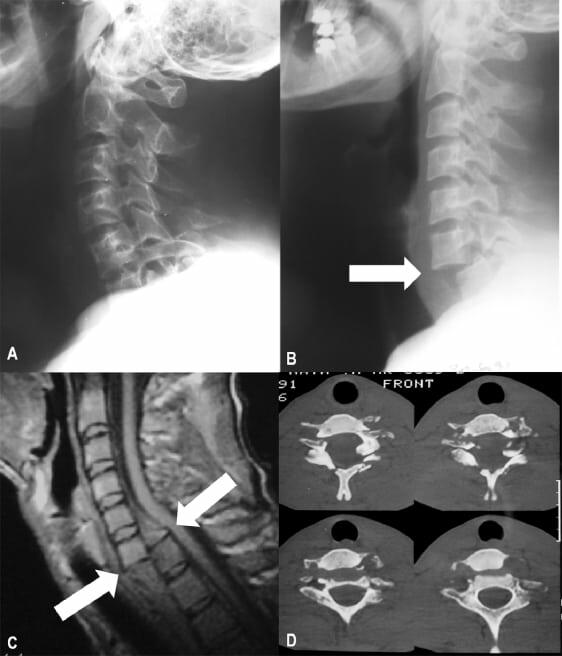 We report the case of a 22-year-old Marine who presented to the emergency department, after a martial arts exercise, with transient weakness and numbness in all extremities. Computed tomography cervical spine radiographs revealed os odontoideum. Lateral flexion–extension radiographs identified atlanto-axillary instability. This abnormality is rare and can be career ending for military members who do not undergo surgical fusion. 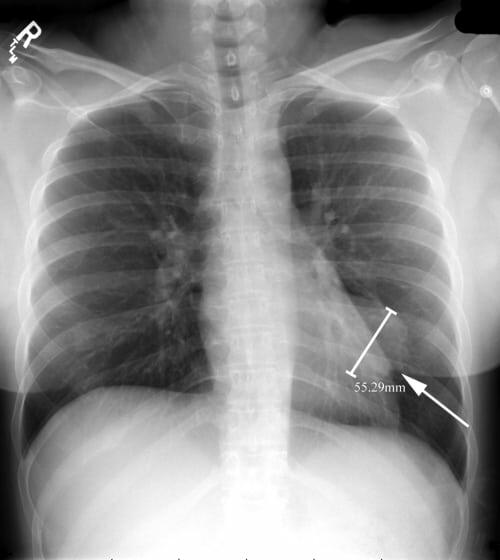 Although pneumomediastinum (PM) is a cause of chest pain, which can be diagnosed on a plain chest radiograph, emergency physicians frequently miss the diagnosis. As follows a description of findings of PM on a chest radiograph. A 40-year-old male with human immunodeficiency virus (currently, CD4 171) presented to our emergency department (ED) with pain and swelling in the left third digit of 3 to 4 weeks’ duration. He noticed the swelling after a fist fight that resulted in compression of his ring on the finger. Infants with food protein-induced enterocolitis syndrome (FPIES) may present to the emergency department (ED) with vomiting and hypotension. A previously healthy, 5-month-old male presented with vomiting and hypotension 2 to 3 hours after eating squash. The patient was resuscitated with intravenous fluids, antibiotics, and admitted for presumed sepsis. Identifying fever can influence management of the emergency department (ED) patient, including diagnostic testing, treatment, and disposition. We set out to determine how well oral and tympanic membrane (TM) temperatures compared with rectal measurements. A 45-year-old woman presented to the emergency department with left wrist pain following a fall. 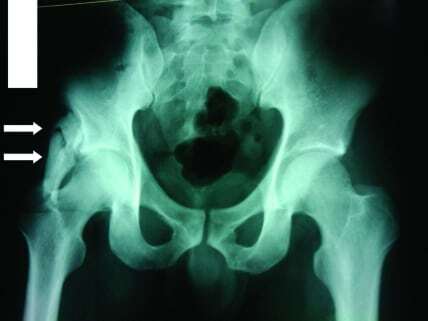 A 35-year-old man presented to the emergency department complaining of right hip pain after being struck by a car while crossing the road. His vital signs were stable, and he complained of right hip pain. He had no other comorbidity. On examination, tenderness and reduced abduction were noted in his right hip, but the gait was normal. We review the advantages and disadvantages of these therapies and recommend Three Factor PCC with small doses of rFVIIa and with vitamin K in life-threatening situations if Four Factor PCC is unavailable. 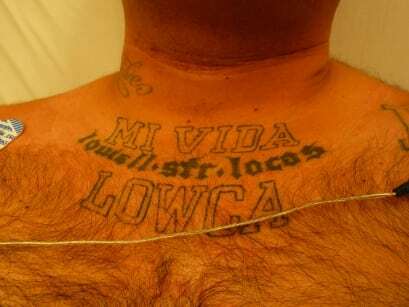 Tattoos and piercings are increasingly part of everyday life for large sections of the population, and more emergency physicians are seeing these body modifications (BM) adorn their patients. In this review we elucidate the most common forms of these BMs, we describe how they may affect both the physical and psychological health of the patient undergoing treatment, and also try to educate around any potential pitfalls in treating associated complications.